M3 robotics lab participated in annual 2018 Research Expo held by Washington State University. 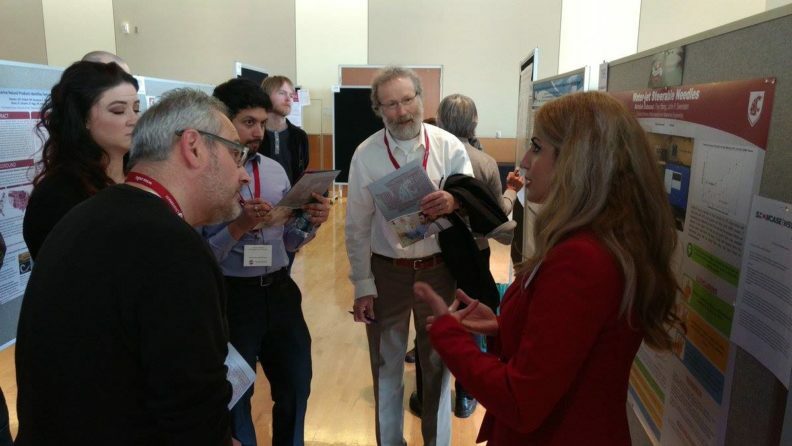 At this Expo people presented their research and judges graded them based on some rubric such as novelty of research, the quality of presentation, poster format, and the importance of research. 2 researchers will be awarded with scholarship in each category. 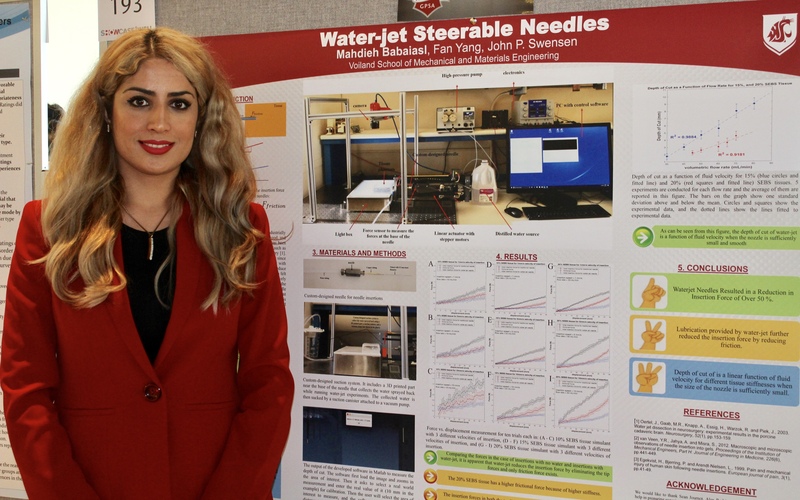 We presented our ongoing research on Water-jet Steerable needles. Water-jet technology has been used in industry for a long time for different applications. In recent years, it has been used in medical applications such as resection of the liver, surgery, and bone cutting. The use of water-jet technology in steerable needles is not studied before and to the best of our knowledge this is the first time that water-jet technology is incorporated in steerable needles. As a side note, steerable needles are flexible needles that due to their flexibility can be directed to reach to difficult-to-reach places in the body that were unreachable using traditional needles. Decreasing the insertion force is really important in terms of reaching to the desired places precisely, reducing the needle bending, tissue deflection, and the pain felt by the patient. Different researchers tried to do it using different approaches. 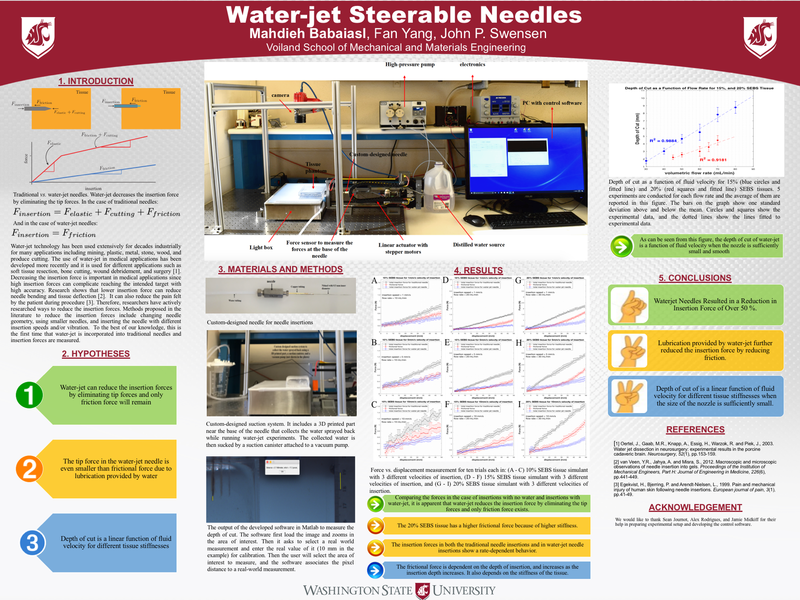 We developed an experimental setup that consists of a linear actuator that drives the custom-designed needle into the tissue, and a force sensor at the base of the needle measures the forces acting on the tip of the needle. 3 different experiments are performed, that are inserting the needle into the tissue without running water-jet (we call this the traditional needles approach), inserting the needle into the same channel without water-jet to measure only frictional forces (because the channel is already cut and there is no cutting forces acting on the tip of the needle), and insertions with running water-jet. Experimental results verified that our hypotheses are right and that water-jet eliminates tip forces and only frictional force remains. The force on the needle is even smaller than the friction in the case of insertions with water-jet due to the lubrication that water provides in the channel. We also measured the depth of cut of water-jet as a function of fluid velocity, and concluded that when the width of water-jet nozzle is sufficiently small, the depth of cut is a linear function of fluid velocity.